Combine the apricot preserves, orange juice, vinegar, 2 tablespoon of oil and garlic in a bowl and mix until well combined. Season the chicken well with salt and pepper to taste. Add the remaining oil to an oven proof skillet. When hot, brown off each side of the chicken quickly. 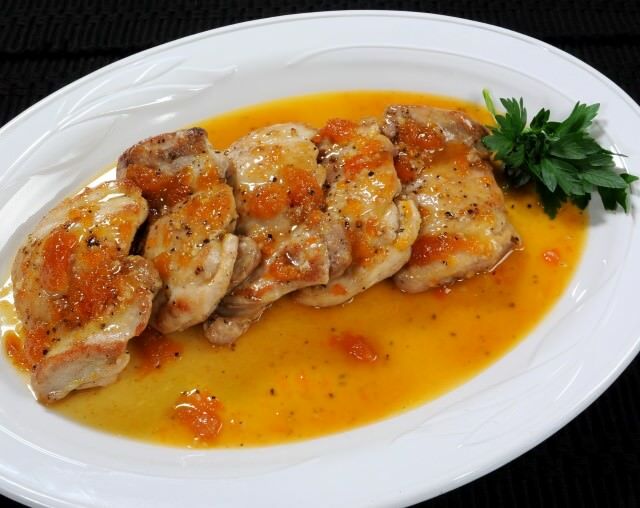 Pour the apricot sauce evenly over the chicken and place the skillet in the oven. Bake for about 10 minutes or until the chicken is cooked through. Serve the chicken with the sauce drizzled over the top and with your choice of sides.